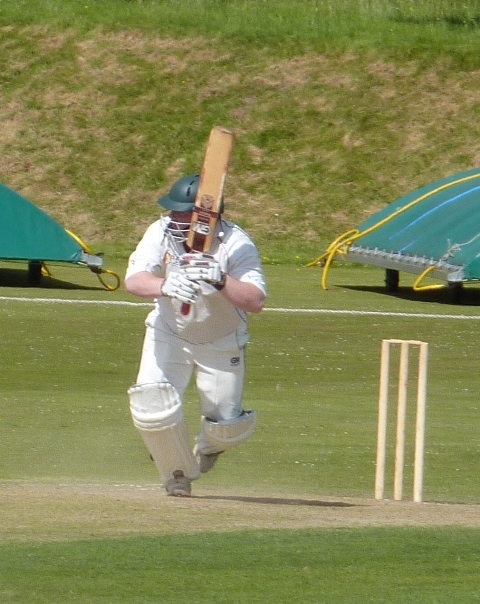 In National League Division Two on Saturday leaders APD Dumfries overcame the challenge of third placed West Lothian by four wickets at Nunholm thanks to an all-round team performance. West Lothian scored 246 for 8 with Scott Beveridge taking three wickets. Dumfries chased that down with seven overs left with Stuart Corbett-Byers scoring 51, Beveridge 45, and 46 not out from Josh Geary. Dumfries decided to let West Lothian bat first and avoid a run chase involving their in-form professional Van Wyk. The decision bore fruit when Josh Geary took a wicket, caught McCutcheon, second ball. Maskrey had the opposition skipper Raven caught by the keeper and with no addition Geary also had the other opener lbw, twenty seven for three in the 10th over. However that was perhaps where the match started for Dumfries with pro Kruger Van Wyk coming out to join Cookson at the wicket. As the division’s top run scorer and with an average of over one hundred sending him back to the Nunholm pavilion was key to the course of the match. In trying to achieve that Dumfries used a series of bowlers, McCutcheon, Patterson, Beveridge, Goodin, but both batsmen proved equal to the task. The pair built a partnership of one hundred and ninety over the next thirty five overs. From being 76 for 3 at the half way point and 93 for 3 after 30 overs they accelerated to 217 with five overs left when the left arm spin of Scott Beveridge had Cookson caught for a vital 85. Two more wickets fell to Beveridge and also one to Jerry Goodin, thanks to a fine one handed close catch by Maskrey. Five wickets fell for just eight runs, including Van Wyk run out by Goodin, going for a second, for his average score – 101. However the eighth wicket pair kept the momentum going especially when Bennie hit two sixes in the last over to reach a challenging total of 246. The tale of the Dumfries reply was that the top five all made contributions. Tom McBride (33) and Andy Parkinson (24) shared a sixty opening partnership before both were out within an over of each other. Beveridge and Geary also shared a sixty run partnership before Beveridge fell, caught and bowled to Cookson, five short of his fifty with the innings at the half way mark, 133 for 3. Again there was another partnership, this time of eighty runs, as Captain Stuart Corbett-Byers came in with intent and hit his first two deliveries for boundaries. He dominated the run scoring in the partnership with Geary and looked like he would be there at the end when Heath had him caught for 51. There was a hiccup as two more wickets fell cheaply but Goodin came in and demonstrated a no nonsense approach to hit two consecutive fours to end the match with seven overs left. Geary held the innings together and ensured that the strike kept rotating during his 46 not out. That, along with his two wickets, earned him the man of the match award from his team-mates. In Western Union Division 2 on Saturday JMS Nunholm beat Bothwell by 7 wickets away at Uddingston. Bothwell scored 204 for 5 and JMS Nunholm reached that total with five overs to spare thanks to a sprightly 101 not out by Trefor Williams. Bothwell batted first on hard track and a fast outfield and the openers faced a father and son Alexander attack. Youngster Niall Alexander bowled perhaps his best spell of the season but was unrewarded with wickets as his spell of five overs went for just ten runs. At the other end Stuart Alexander beat the bat consistently with the ball moving away but his reward was edged fours down to third man. After ten overs Bothwell has reached just fifteen. Cammie Telfer, after a change to bowl up the Bothwell hill, and Douglas Brotherston settled into the attack as the openers Stewart and McKenzie batted steadily. Brotherston bowled a tight spell of off-breaks but after twenty five overs the openers were still there and had pushed the score past seventy. McKenzie started finding the boundary sweeping Brotherston and picking up a short delivery from Niall Alexander for six. However he was bowled attempting to drive Brotherston for 58. That first breakthrough came just after the century opening partnership. Nunholm were bowling and fielding well in batting friendly conditions with twelve year old Dean Brotherston arguably the best of the fielders on the day. Peter Johnstone bowled well in tandem with Stuart Alexander and the latter had Stewart out for a patient 40 well caught by Williams at gully. Johnstone dismissed the next batsman for nought caught by Davie Davidson, wearing the gloves for the day, to make it 135 for 3 in the 37th over. Andrew Batty joined Johnstone in the attack and was unlucky as several edges flew to the boundary. However Main, with 50, and Bawa, with 27, succeeded in pushing on and sharing a seventy run partnership. The two Alexanders came on in the last few overs and Stuart was finally rewarded for an imperious spell of bowling with two more wickets. Bothwell ended on 204 for 5 which was probably a below par score for the home side. That proved to be the case as the elder statesmen of the team, and the ‘cannon-fodder’ openers, Williams and Farries consolidated through an accurate opening spell from seamers Eyles and McKenzie and then kept up with the run rate. Their fifty partnership came up in the 16th over. The entry of Bawa and Main failed to achieve the breakthrough but instead accelerated the scoring with Williams relishing hitting through the offside and Farries upper cutting Main for four. The century partnership was reached in the 25th over. Off-spinner Din and Iqbal came on to pull things back for Bothwell and a short delivery from the former induced a top edge catch from Farries for 51 with the first wicket falling on 137. However Williams had the stamina, mental if not quite physical, to take the side to the win crashing several loose deliveries to the leg side boundary whilst challenging the fielders to hit the stumps for a run out. He and Batty took the score on to 180 when two wickets were swept away, one to a reverse sweep, and one to an orthodox sweep the very next ball. Marcus Richardson then batted confidently with Williams until the latter topped his innings with the last ball of the game. Requiring three to win, and three for his century, he proved new tricks can be learnt by middling a reverse sweep come pull which soared over point for the winning boundary.